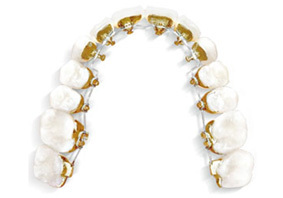 Incognito is a new generation of orthodontic braces - a modern and invisible alternative to conventional braces. Because they are placed behind your teeth, no one will ever know you are wearing braces unless you tell them. IncognitoTM Appliances can give you a beautiful smile, even while you're wearing them. With the IncognitoTM System you get efficient, effective tooth movement and great aesthetics. From the outset, the brackets and wires are engineered to deliver targeted results. It is relatively easy to keep clean and the only one who knows you are having orthodontic treatment is you. It is designed only for your teeth (bespoke) so not only does this mean it is a perfect fit but that you will get perfect results. The remarkable flat design of the gold alloy brackets (anti-allergic) provides maximum patient comfort, do not distort lip contours and are virtually unnoticeable in normal social situations. Because lingual braces are fitted to the inside of the teeth, they can often give increased discomfort to the wearer, particularly in the early stages, due to irritation of the tongue. Speech will be affected initially, however, the vast majority of patients adapt to this type of brace within a month. Treatment times can vary. Lingual appliances are a possible invisible option for adults and older teenagers. They are more time-consuming to place, with increased time in the dental chair for adjustments which increases the cost of treatment. Lingual appliances are only available as a private treatment option.